The Green Party doesn’t have a monopoly on the truth. They just state and campaign for what is common sense, an agenda that reflects the positions and interests of the 99%. A single payer Medicare for All health system. A minimum wage that is a living wage not a sub poverty wage. Taking action on climate change with a Green New Deal – cut the military by at least half and tax the rich (including a stock transfer tax) to pay for a full employment public jobs program and $300 billion annual investment in clean, renewable energy. Stop extreme extraction like fracking of natural gas, offshore oil drilling and mountain removal. Cancel student student debt. A non-interventionist, pro-democracy foreign and military policy. An end to various wars: on terror, people of color, and American’s civil liberties. Legalize it – an end to the war on drugs. The gap between the rich and the poor is greater than it is been in a century. The last 30 years has seen a steady increase in the transfer of wealth and income to the rich. Tens of millions of Americans are out of work. 50 million Americans are so poor that they qualify for food stamps. The Pentagon budget is out of control, a corporate welfare pork barrel that spends tens of billions of tax dollars to build planes and tanks that are immediately mothballed in the desert since there is no need for them. And the heating of the planet under climate change accelerates beyond the worst case scenarios. Congress’ response is to shutdown the federal government ostensibly over a non-existing debt crisis and a flawed Obamacare program that was primarily a victory for the health insurance industry. The country blames the Republicans and Tea Party fanatics for costing the economy tens of billions of dollars. The Democrats declare victory and begin to negotiate a budget deal on the Republican terms. In mid-December Congress will craft together another “grand bargain” around the budget. While they will argue over the details, the broad outline will be protect the rich from tax hikes, weaken / cut Social Security, Medicare, food stamps, restore some funding to the Pentagon from the sequestration cuts and continue to divest from Americans. Oh, and perhaps some more corporate welfare in the guise of a meager “job stimulus” effort to repair whatever infrastructure is most important to the 1%. The organized liberal community will wage their fingers at the Democrats (more in private than in public) while publicly continuing to blame the Republicans for the mess and thunder that the solution is to elect more Democrats (e.g., let’s repeat 2008). The rise of the Tea Party is just another example of the increasing control of corporate power and the 1%. Fascist parties are also on the rise in Europe, often pulling 20% of the vote while scapegoating immigrants and promoting “austerity” budgets. The auctioning of the Democratic Party to corporate interests under Clinton continues to accelerate, with the 1% buying both major parties. It was the Democrats that provided the votes needed to bail out Wall Street from the criminal housing bubble manipulation while Main Street and Martin Luther King Jr. Blvd. were shuttered. Corporate owned media repeats the untruths of government and corporate America as objective reporting, while critics are dismissed as fringe crackpots. 4 Comments on "Why I vote for the Green Party"
Your agenda sounds really good ! I totally agree that the 1% owns all the candidates in the Republican as well as the Democratic party . nothing will ever change that unless funding campaigns is outlawed ! if ALL the parties were to receive equal time and equal billing on publicly funded television ONLY and were literally not allowed to have any other advertising ; then WE THE PEOPLE could take our country back !!! This is the only way anyone will hear what the GREEN party’s agenda is and who is running for the office of president! This is the only way for the 99% to have a voice. I applaud the article for promoting the Green Party. Bravo for mentioning Green Party solutions. The Green New Deal, the platform of Dr. Jill Stein, Green Party presidential nominee in 2012, and approximately hundreds of local, state, and federal (Eliot Barron special congressional election) in 2013, should be mentioned. The Green New Deal’s Solar energy jobs, geothermal energy jobs, wind energy jobs, weatherization jobs, rail jobs are the eco for the economy solution. The article is weak in that it even bothers to mention the two larger parties. The Green Party focus for candidates, and Green Party advocates in the public square should be about the Green Party’s positive solutions. Great piece! My sentiments exactly. Mark Dunlea’s article is right on the mark–clear, concise, and persuasive. Elections are momentary hiccups thrown up by the ruling power structure. 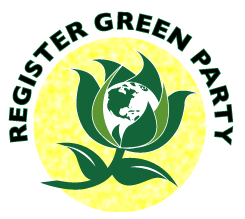 We need a long-term, comprehensive strategic plan for growing the Green Party and accumulating political power. It all starts at the local, grassroots level. “Don’t mourn, organize” said Mother Jones. We need to organize town by town, county by county. We also need another strong candidate to run for Governor in 2014. I haven’t seen the results yet for Syracuse, but I hope Howie Hawkins will be up for another run and build on his success 4 years ago. The Green Party platform is the only one I know of that holds out any hope for staving off the coming disasters of environmental, economic, and political degradation. If Greens don’t step up, who out there can and will?